i love this thing … the Norpro Egg Rite Egg Timer. 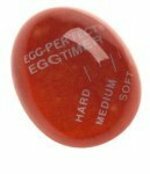 ok … i am a sucker for soft boiled eggs and this thing makes it really easy to make the perrrrrrfect soft boiler. just through this into the water and wham!, it changes color to indicate what stage the egg is at. for $7, you’ll always now get perfect eggs. thank you to Bree Humphries for getting this for me as a gag gift (that turned out to be a gift i really like and use). This entry was posted in Products on November 30, 2005 by auren. Here’s how it works: you connect the Akimbo Player to your TV and the Internet, and you have access to a collection of over 5,000 video programs, and it’s all available on demand. You can check out shows from National Geographic, History Channel, FitnessOnDemandTV, BBC, CNN, Turner Classic Movies, anime, great Chinese films … all on demand. The one drawback is the catalog is a little eccentric … they don’t yet have many of the mainstream shows (but Akimbo’s founder promises they’ll have that soon). This entry was posted in Products on October 26, 2005 by auren. 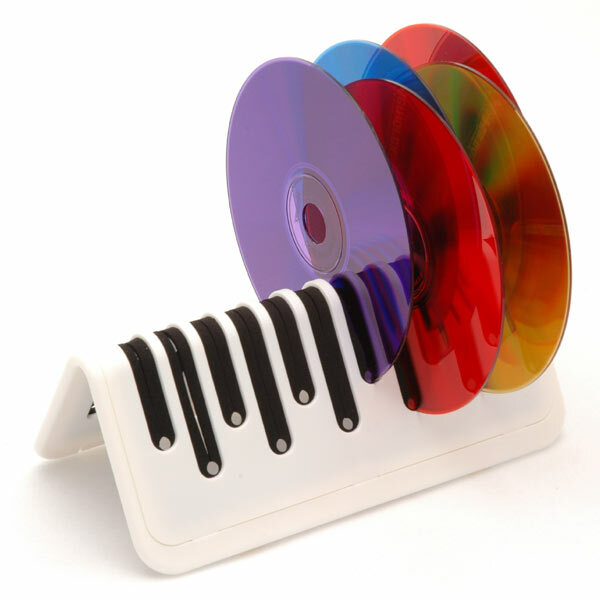 The Disc Hub is a great way to store your CDs and DVDs. and it is the newest Silicon Valley 100 product. I love these DiscHubs … they’re my favorite way of storing and displaying CDs (and perfect for those of you who subscribe to services like GameFly or NetFlix so those packages don’t end up on your floor). And they look so cool. Not only was the discHub a good idea, but that the company got the implementation right: The neoprene membranes lining each slot did a good job of holding the discs securely without scratching them, while the staggered slots themselves made it easy to see and grab any disc. One of those things I never knew I needed until I used it. 4 out of 5 mice. And DiscHub is locally based (in San Francisco) with a great eye for design. This entry was posted in Products on May 31, 2005 by auren. I’ve been working with the guys from Reactrix for the last few months now. Companies like McDonald’s, Sam Goody, AMC Theaters, and others have been deploying Reactrix’s systems to enhance their customer experience and also to promote products. This entry was posted in Products on May 8, 2005 by auren. There is a rumor that the Brondell Swash recently got picked up by Home Depot and Bed Bath & Beyond. This is an extraordinary amount of success for a company that just started selling units a few months ago. i have a particular interest in Brondell as they were the first Silicon Valley 100 product we sent out. Their incredible recent success has really helped the influence marketing industry. This entry was posted in Products on April 2, 2005 by auren. It was a scene from a TV commercial … i was standing around at a party and i noticed that Rob Reid has a really clean shave. commenting on this, Rob launches into a log product pitch on the Gillette M3 Power razor and tells me that his fiancée was also impressed with his close shave. Nearby at the same party, fellow shaver Alan Peterson chimes in that he loves the M3 Power too. they both made the switch right when the product come out — and neither will ever go back. of course, i ran out to my local Walgreen’s the next day to pick up the $10 shaver and the $2 blades. pricey. is it worth it? well Rob and Alan swear by it. my tests for one week are very positive and i’m liking it enough to spend the time blogging it. Summation: this is definitely a product worth testing. I asked Alan Peterson, who is my new maven on all things shaving, a question where to get cheap blades. Ah, cheap blades. That’s a tough one. Even at Costco there doesn’t seem to be a huge discount, so I’m not sure what to tell you. However, don’t feel that you have to get the blades housed in matching green plastic. Results from my test lab indicate that you can use the plain old blue “Mach 3” blades with the vibrating green handle. The only difference, as far as I can tell, is that the green cartridges have more yellow than the blue ones. When traveling, I now take the battery out of the handle–sometimes the button gets pushed by the baggage handlers/inspectors, and then you arrive with a button that when pushed has no perceivable effect. This entry was posted in Products on March 28, 2005 by auren. it would be great if most people put a little code on their paper business card. you could give the card to someone you want to make contact with. if they saw the code they could, instead of typing in your contact information into their PIN (or using a card-scan reader), they could just type in the code and it would automatically download your most current information. of course, ideally this would also work on a mobile phone. This entry was posted in Products on March 17, 2005 by auren.